The 2018 star-studded celebration of community media will take place in the spring. 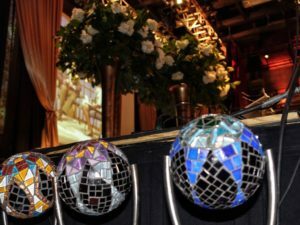 The EPIC Awards 2018 will be held on April 25th at The Fillmore in downtown Silver Spring and the evening will once again be hosted by CNN’s Joe Johns. Last year’s event honored journalists such as Juan Williams and the late Jim Vance for their contributions to our homes and communities, just to name a few. The upcoming elegant evening at The Fillmore will include an opening reception and dinner. It’s an event you won’t want to miss. EPIC Awards 2018 sponsorship and table orders are available. Find sponsorship information or download the sponsorship packet and order form. Contact the Fillmore Silver Spring for directions, 301.960.9999. 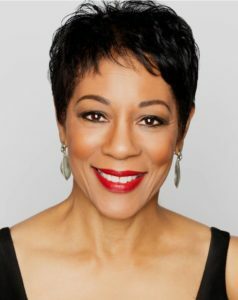 Andrea Roane has been with W*USA 9 since 1981, and has anchored every news shift from morning to afternoon and late night. She currently anchors WUSA at Noon and is WUSA9’s Health reporter. A multi-EMMY and GRACIE Award winner, Andrea has covered a wealth of hard news stories, from politics, the arts,education and sports to women’s health and women’s empowerment issues. She has interviewed news makers,entertainers, politicians, plus your neighbors, friends, and colleagues all over the DMV. Her reporting has taken her across the U-S, overseas to Jerusalem, the Virgin Islands, and Havana, Cuba. Andrea is best known to viewers for her passionate reporting on breast health issues and promoting the importance of Early Detection in the fight against breast cancer. 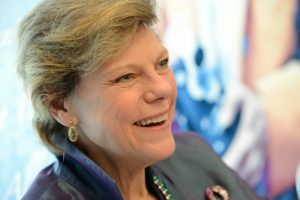 Andrea’s commitment to women’s health and community service have been recognized with countless national and local awards. For her outstanding work as a journalist and for her community service, Andrea was awarded the 2015 Board of Governors Award by the National Academy of Television Arts & Sciences, National Capital Chesapeake Bay Chapter. In 2014, Andrea was inducted into the DC Hall of Fame. Andrea received the 2012 “Faith Does Justice Award” from Catholic Charities of the Washington Archdiocese. Andrea has also been honored by the Sibley Memorial Hospital Foundation with its Community Service Award in 2009 for being a passionate breast cancer advocate. In 2006, she was named one of Washingtonian Magazine’s “Washingtonians Of The Year” for her continued work on breast cancer awareness through her Buddy Check 9 initiative. Among her many community affiliations, Andrea is; a member of the Capital Beast Care Center Community Advisory Council, co-chair of the Kennedy Center’s Community & Friends Board; a Trustee Emeritus of the Catholic University of America; a Dame of the Order of Malta; a Sustaining Director of the Prevent Cancer Foundation; a member of the board of the National Museum of Women in the Arts; a member of the International Women’s Forum, DC; a member of the Metropolitan (DC) Chapter of the Links, Incorporated; and a lifetime member of the NAACP. If The Washington Post is right — and Tommy McFLY is the “local Ryan Seacrest”— then he’s the multi-platform voice, anchor and host for the world’s most powerful city and its media ambassador to the rest of the nation. 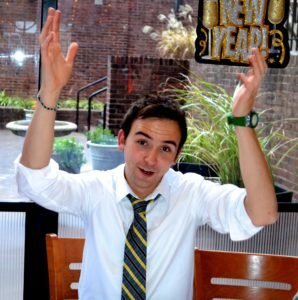 An only child Gemini, rescue dog-loving millennial, originally from Scranton, Pennsylvania, Tommy is always on the move around Maryland, Virginia, and Washington – and he’s on 24/7. Weekday mornings, 5 to 9 a.m., Tommy hosts The Tommy Show on 94.7 Fresh FM –- sort of like a “fun table at a wedding.” Joined by co-hosts Kelly Collis and Jen Richer, and heard by approximately one million listeners each week, it’s “Today’s Fresh Music” along with laughs, topical questions, celebrity interviews, and entertainment news. And it’s Tommy, Kelly, and Jen as they are, being who they are, and living a real life in the DMV. On television, at NBC 4, and streaming online, Tommy is either working the red-carpet for star-studded events like the Kennedy Center Honors or continuously discovering the latest trends, finding inspiring stories, and uncovering the real Washington. And nowhere is the real Washington and real Tommy on display more than when he’s involved with the community he calls home. From bringing together more than 5,500 fans at Freedom Plaza to cheer the United States soccer team in the World Cup, to delivering the commencement address to students at one of the best public magnet high schools in the country, School without Walls; from mastering the ceremonies of grand occasions and milestone announcements with guest lists that include heads of state, federal, state, and local officials, and A-list celebrities, to emceeing events for vital organizations like American Red Cross, DC Central Kitchen, Chris4Life Colon Cancer Foundation, Make-A-Wish, The Alzheimer’s Association, The Washington Humane Society, St. Anne’s Center for Children, Youth and Families and many more; from raising essential funds for holiday wreaths for the fallen heroes at Arlington National Cemetery and monies for the George Washington University Hospital Mobile Mammography Unit, to organizing events and encouraging greater support for Best Buddies Virginia, where he volunteers on the state board, to forge a more inclusive society for everyone –- Tommy uses the mic not just to entertain but to inspire, give back and pay it forward. It’s that unique blend of social responsibility and community engagement — and peerless ability to connect with people — that’s even received the notice of the White House. During the 2013 Inaugural festivities, Tommy was tapped as the emcee of the President’s National Day of Service on the National Mall. For the past four years, he has also served as the official emcee for the National Christmas Tree Lighting Pre-Show. And for four years running he’s emceed the White House Easter Egg Roll, which annually brings together Hollywood stars, chart-toping music talent, and 30,000 citizens from across the country. He is, as Cathy Alter of The Washington Post Magazine called him, “a prince of DC media.” But the better title might just be D.C.’s most sought after, trusted friend. Jarvis currently serves as Vice President of Corporate Relations of Pepco Holdings, Inc. (PHI). In this capacity, Jarvis and her team develop strategies around corporate goodwill in the communities served by Pepco Holdings and its three operating utilities. She works closely with the region presidents for Pepco, Delmarva Power and Atlantic City Electric. Based in Washington, D.C., Pepco Holdings employs more than 4,700 people, owns more than $16.1 billion in assets and generates approximately $4.8 billion in annual revenues. Pepco Holdings serves 2 million customers as the parent company of Pepco, an electric utility serving Washington, D.C., and suburban Maryland; Delmarva Power, an electric and gas utility serving Delaware and the rest of the Delmarva Peninsula; and Atlantic City Electric, an electric utility serving southern New Jersey. Pepco Holdings is a recently acquired subsidiary of Exelon Corporation, one of the nation’s leading energy services companies. Exelon is headquartered in Chicago and trades on the NYSE under the ticker EXC. Ms. Jarvis previously served as Vice President of the award winning Corporate Communications team of Pepco Holdings, Inc. (PHI). She also has served as PHI’s face and voice in radio and TV commercials for Pepco, Delmarva Power and Atlantic City Electric. 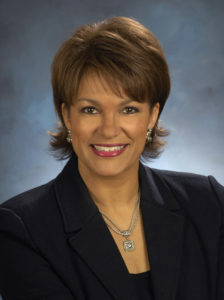 Before joining PHI in 2004 as Manager, Media Relations, Ms. Jarvis served as a news anchor and reporter with NBC4 in Washington. She enjoyed more than 20 years of success in TV and radio news, advertising and marketing in the Washington, D.C., Ohio, Michigan and Connecticut broadcast markets. Jarvis currently serves as the Immediate Past Chair for Leadership Montgomery. In 2013, Jarvis was appointed as Board Chair for the Boys & Girls Club of Greater Washington and served in this role until 2016. In addition, Jarvis serves on the boards or advisory councils of the Washington D.C. Police Foundation; DC Education Fund; Washington Area Women’s Foundation; N. St. 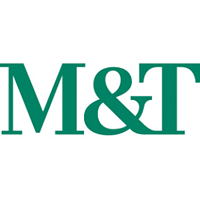 Village; South East Tennis and Learning Center’s Recreation Wish List Committee; Catholic Charities; Children’s National Medical Center and Generation Hope. Jarvis has served on the boards of a number of other charitable organizations in the Washington, D.C. area and beyond and has handled emcee duties for dozens more. Jarvis graduated with a degree in International Business from Hope College in Holland, Michigan, and began her career in sales, marketing and advertising in the Midwest and along the East Coast before moving into broadcast news. Lorna Virgili was born and raised in Havana during the height of the cold war without liberty of expression or Freedom of the Press and today she is a 28-year veteran broadcast journalist. She came to the United States in 1980 as part of a State Department family reunification program. Her writing and communications skills first developed as a child in Cuba where she would write long letters to her father who had fled the island and was living abroad. But, her letters never made it to her father. Lorna’s mother would read them and destroy them fearing that mailing them would alert the communist regime of their intentions to leave Cuba. Once in the United States, Lorna was an ESOL student who learned English as a second language, attended high school and university in South Florida. She started her communications career as a news reporter in South Florida and worked for both, Telemundo and Univision Networks. As a local reporter, she produced and conducted a one-hour weekly public service show about Florida politics and implemented an EMMY® nominated consumer related segment. In 1999 she received a job promotion that brought her to Washington, D.C. as correspondent for the Univision Affiliates, reporting from the U.S. Capitol and the White House. During her tenure as a Washington correspondent, Lorna was responsible for the production of daily news reports to ascertain that proper information was delivered to Hispanic communities in 500 markets across the United States through the Univision Affiliates Network. In 2002, Lorna ran as a candidate for the United States House of Representatives. Her own congressional campaign gave her the edge and knowledge of the internal grinds of politics, thus, she was called upon to perform Hispanic Media Outreach in Central Florida for the 2008 Obama Presidential Campaign. Then, she launched her business, the National Hispanic Communications Group. Since 2009, Lorna has served as the ongoing official Spanish Language Spokesperson for Montgomery County Government. She designs and implements Hispanic Outreach Campaigns for the County. She also hosts and produces two Spanish language and two English language Cable Television Shows for Montgomery County Government. In addition, she launched and hosts the County’s Award-Winning Spanish language radio show “Montgomery al Dia”. She is a highly regarded community leader with constant radio and television appearances in the Washington Metropolitan region. 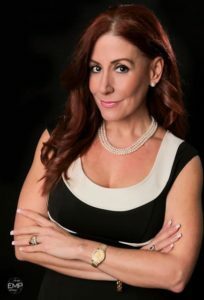 She has received numerous awards and recognitions through the years, including 2011 Top 100 Women in the State of Maryland, three National Association of Counties Achievement Awards and a Telly Award honoring excellence in television for her media work at Montgomery County Government. Lorna is a graduate of Leadership Montgomery and Founder of the Maryland Hispanic Gala, an annual fundraising event that grants scholarships to students in financial need from diverse communities throughout the State of Maryland. She lives in Wheaton with her son Daniel, who this semester graduates from the University of Maryland College Park with a BA, not in communications, but in Computer Science. Mary Ellen Icaza has over 15 years of experience working in urban public libraries. Presently, she is the Assistant Director for Outreach and Programs for Montgomery County Public Libraries in Maryland, a system of 21 branches, where she oversees all programming, community outreach, and special events. She leads Early Literacy programs and services, the Workforce/Business Development program, the Summer Read and Learn program, and award-winning outreach services team. She works with nonprofit organizations and local government agencies to develop partnerships and administers branch operations at nine locations. Additionally, she serves on the Board of Directors for the Montgomery County Collaboration Council and the JCA Heyman Interages Center Advisory Board. Previously, Ms. Icaza was the Virtual Services Program Manager, responsible for all web and social media communications and new technologies for the library system. Additionally, she has worked in web communications and project management in education and government. Ms. Icaza received her Master of Library Science degree from the University of Maryland, College Park and holds a Bachelor of Arts degree in English from The Catholic University of America. 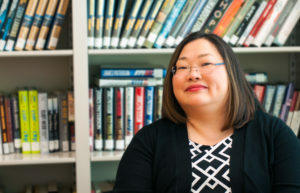 She was named a 2004 Library Journal Mover & Shaker and was selected as a participant in the 2015 American Library Association Leadership Institute. She lives with her husband, Javier and children, Christian and Victoria in Montgomery Village, Maryland. Jessica Theis is a 9th-grade student attending Blake High School, who has had a lifelong passion for television, film, and photography. 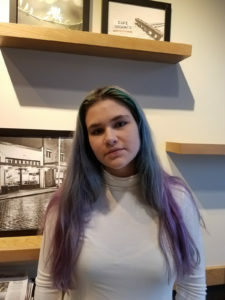 When she was introduced to Montgomery Community Media (MCM) through Mandi Wyndham’s fantastic Backpack Journalism Camp in the summer before her 6th-grade year, Jessica finally found a place where she could pursue her dream of becoming a film director. Taking advantage of all MCM has to offer, Jessica has thrived through attending camps, taking classes, creating Backpack Journalism pieces and volunteering at MCM. MCM has empowered her by teaching her technical skills, interpersonal skills, and professional skills at a young age. In just three years, Jessica has become certified in Backpack Journalism, Studio Technician, Studio Director, Non-Linear Editor, and, most recently, Field Producer. She is one of the youngest people to have earned a Studio Director Certification at MCM. Jessica is proud to have worked as Assistant Director on Tony Spearman-Leach’s Telly Award-winning show “Congratulations You’re In!” and to have had her Backpack Journalism piece “Sublime Slime” win a Monty Award. Winning the Haig Ellian award for 2017 was a highlight of her year and she is hard at work creating a video awareness campaign for the Volunteer Services at the Washington Veterans Association Hospital for the award. Currently, Jessica enjoys volunteering as a camp counselor, volunteering on numerous TV shows produced by Marian Merewitz, working on Backpack Journalism pieces, and serving as Vice President of MCM’s Explorer Post 995. After completing over 450 community service hours through MCM and Girl Scouts, Jessica is still going strong. A member of Girl Scouts since she was in kindergarten, Jessica enjoys using the skills she learned at MCM as a founding member of the Girl Scout Service Unit 31-6’s Media Team and more recently as a founding member of the Girl Scouts of the Nation’s Capital Teen Social Media group. Jessica has worked hard at earning Girl Scout Higher Awards, including the Girl Scout Bronze Award and the Girl Scout Silver Award. She has almost completed the community service requirements for her Silver Trefoil Award and has begun work on her Gold Award. Outside of Scouting and MCM, Jessica enjoys photography, video games, spending time with her friends, and going to the beach.